The collar is finished. 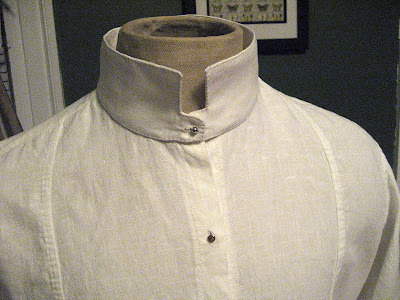 I need to starch it, but I'll wait until I've finished the cuffs, and do them both together. Still, it stands up nicely on its own. The starch will help that, and will give it an almost papery sheen as well. 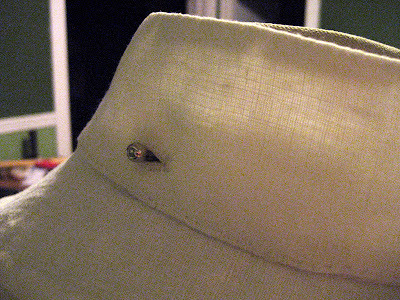 I'll press the seams nice and crisp too. 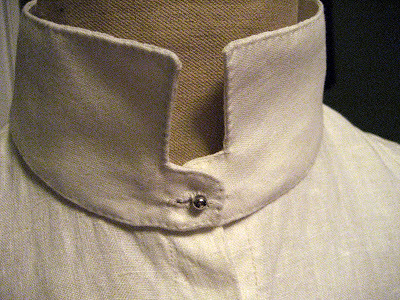 It isn't clear from these photos, but one thing I did to help alleviate some bulk in the buttonholes was to give the front holes a...hmm, I'm not sure how you call it. It isn't just a straight flat hole, but a round punch-out where the stud rests, and then the slit for the rest. I'll post an image later of what I mean. In any case, here are some close-ups of the collar front and back. As always, you can click the images for a larger view.